Though not an official category, “Outrage” is a word that was featured on the promo reel at this year’s Boulder International Film Festival. And indeed many of the documentaries at BIFF fostered a sense of outrage, usually with the aim of motivating an audience to get out of their seats and act. The best of these films really do shed light on outrageous situations. Corporations or governments flout laws. They take, they poison, they waste, they lie. In a few cases, a solid documentary really can effect change. And then there are documentaries that want to foster outrage without doing the hard work of research and introspection. Are the facts right? Is the logic sound? Has the other side been presented fairly? Are there any unfair cheap shots? My warning flags go up when I see an “outrage” documentary where victims make direct emotional appeals against faceless corporations, appeals which are not researched, documented, rebutted, and couter-rebutted. The appeal to justice needs to be backed up by fairness and facts or I feel emotionally ripped off. That’s not to say the victims aren’t sometimes right, but without the sense of a fair trial, I feel taken advantage of — like I am complicit in the lynching of someone who hasn’t been allowed a court date. Split Estate raises more of my flags than many other docs at this year’s fest. “Split estate” is a legal term referring to the common situation whereby the owner of the surface land — often someone who lives on the land — is not the owner of the mineral rights underneath that land. Specifically, a lot of Western Colorado is owned by private citizens, and most of them do not own the mineral rights under their land, rights which are leased by oil and gas companies. And if and when it comes to a fight over access, mineral rights usually win. If you were a homeowner, you would be outraged that a company like BP or Conoco could build a drilling rig on your property and that you would not have the right to stop them. But as an audience member whose sense of outrage is deliberately being piqued, I have to put on the brakes and wonder whether the homeowners entered into these agreements willingly. Not to sound callous, but didn’t they know that this could happen when they bought their property? Are they like the young men who signed up for the army and then complained that they were shipped out to a war zone? This is perhaps the biggest unanswered question raised by Split Estate. It was the first question I asked and I waited the duration for an answer. That’s not to say that there isn’t room for some genuine and well-founded outrage. Oil companies are apparently allowed a lot of secrecy. The ingredients of their fracking fluids (it’s a technical term, not a cuss word) are allowed to remain secret, even against demands from health professionals trying to do research into whether they are harmful or not. The oil industry’s mouthpieces go on camera and smile their disingenuous smiles and insist that their fracking chemicals are completely safe, while a little homework, healthy skepticism, and common sense tells us otherwise. If they’re safe, why not tell the world what’s in them? But then director Debra Anderson allows the victims too much leeway. Neighbors blame petrochemicals (not the fracking chemicals but common hydrocarbons) for everything from colds, headaches, and asthma, to severe neurological damage. The movie lets them say these things without doing the hard work of proving that there is a direct causal relationship. Split Estate is a split movie. On the one hand it crosses the line, encouraging more outrage than it can back up. As someone who believes in fair trials, this is the part of the movie that I wish had been a bit more introspective and cautious. On the other hand, it sometimes tells a compelling story with a villain, victim, and injustice when it talks about spills, coverups, and corporate secrecy. Split Estate certainly fracked me. gail: I saw both FRACKNATION and SPLIT ESTATE. When I bought property in Louisiana I made sure I owned the mineral rights because of so much drilling for oil. I live in Westminster, Colorado. I saw the movie FRACNATION on Channel 12 at 1:00AM in the morning. I thought it was excellent. I offered to buy the DVD for a friend who is on the City Council in Broomfield, Colorado. 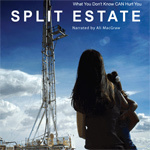 By accident I saw SPLIT ESTATE which was on following FRACKNATION. I was curious about the title and was stunned that it was a TOTAL contradiction of FRACKNATION. The program, SPLIT ESTATE seemed so accurate. There were the illnesses; the scenes of the property with the bubbles coming up from the ground; the "expert" testimony. I was so depressed I was not able to finish looking at the movie. A friend suggested that I write and hoped I might find an explanation.I appreciate any help you may offer.